Vastu Shastra is a science which helps us to achieve material prosperity, mental peace, happiness and harmony at home and work place. Vastu harnesses the various energies present around us in a particular pattern so that they blend harmoniously with the person. 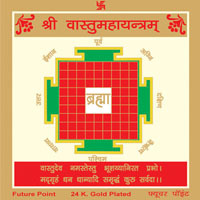 Sampoorn Vastu Dosh Nivaran Yantra is designed specially to attain this objective. It consists of 13 yantras viz. 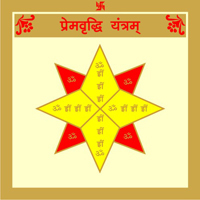 Vastu Dosh Nivaran Yantra, Baglamukhi Yantra, Gayatri Yantra, Mahamrityunjaya Yantra, Mahakali Yantra, Vastu Mahayantra, Ketu Yantra, Rahu Yantra, Shani Yantra, Mangal Yantra, Kuber Yantra, Sri Yantra, Ganpati Yantra. 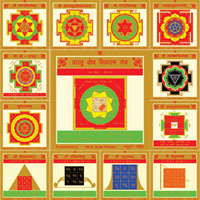 All these yantras help in maintaining the balance and harmony in our external and internal vaastu and thus make our life more happier. By worshipping vaastu purush vaastu yantra, Brahma, Vishnu, Mahesh and all other gods and goddessess are worshipped. The vastu pooja disintegrate all obstacles in the environment which otherwise may impede us. It also protects us from untoward harm and misfortune. It can be installed at home as well as at work place in North or East direction. 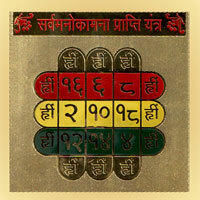 Recite the following mantra. 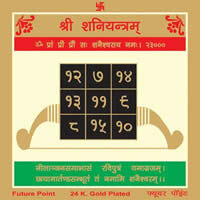 Om Namoh Bhagwate Vastu Purushay"